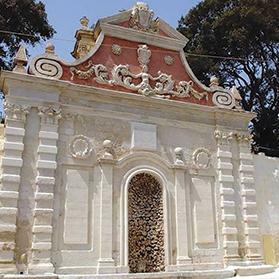 Flimkien għal Ambjent Aħjar’s second event for 2016 is a heritage walk by Fr Eugene Teuma to Rabat and the Roman Melita – which extended from Mdina to Rabat – Malta’s richest area in terms of Roman remains. This walk around the town of Rabat starts from St Francis’ Friary (next to the Santo Spirito Archives) at 2.30pm tomorrow and will explore the fascinating early history of Rabat and Mdina. The few 17th and 18th century texts that mention the remains allow us to formulate an idea of how Rabat looked as regards its buildings, roads and especially the impressive fortifications that once surrounded it. A good part of what remains of ancient Rabat survives in the narrow passageways, water systems, and cellars to be found beneath Rabat’s streets. The tour starts from one of the few remaining vestiges of this once impressive system of fortifications that withstood two years of siege until AD870. The events that followed spelled the end and the destruction of this ancient town and its impressive city walls which, though over 1,000 years old, had serving their purpose well. Participants will be able to catch glimpses of this town and follow its outline within the modern town of Rabat and Mdina. Fr Teuma has been fascinated by the archaeological remains and history of Rabat and Mdina, especially the Roman town of Melita ever since the chance discovery of a complex water system and galleries beneath Rabat in the 1980s. The documentation of these remains was instrumental in the interpretation of the surviving surface structures around Rabat and Mdina which led to the drawing up of a detailed interpretation of what the fortifications around the town of Melita once looked like. This event is open to FAA members. • Those taking part are asked to wear comfortable shoes and warm, showerproof clothing. This two-and-a-half-hour walk will go ahead in case of showers. Tea/coffee, sandwiches and cakes will be served at the end of our tour.